What changes make it different? Luckily for this South Korean automaker, Sonata is bucking the trend. Year-over-year sales were up 9 percent as America’s demand as a whole dropped 8.2 percent for cars – and jumped 9.3 percent for crossovers, SUVs, and pickups. That’s testimony to Sonata’s appealing value proposition. It’s also evidence that the automaker will be looking to juice interest in the 2017 Sonata before the freshened 2018 model debuts. Why should I buy a 2017? It’s comfortable, handsome, and is available with all the key safety features, including an automatic braking system that helps earn it highest crash-test ratings. The front-wheel-drive five-seater returns with three available gas engines and a pair of gas-electric hybrids, one a plug-in that can travel 27 miles on electricity alone. The lineup includes a new-for-’17 entry-level Base model and continues through volume-selling SE, Sport, and Limited grades. The Eco model and the performance-juiced Sport 2.0T and Limited 2.0T editions are turbocharged. Both hybrid versions come in Base and upscale trim. In the gas-only line, the SE is a strong transportation value. It lists for just $22,785 and comes with alloy wheels, rearview camera, and an easy-to-use telematics system with Android Auto and Apple CarPlay connectivity. Shopping any Sonata should yield significant discounts as the model year winds down. An updated ’18 with revised styling is on the horizon and dealers ought to be eager to clear inventories before it arrives. Should I wait for the 2018 model instead? If you want the latest appearance inside and out, and probably upgraded running gear intended to hone ride and handling. The basic structure, dimensions, and mechanical features won’t change. And the ’18 Sonata is apt to cost more. But it’ll have the styling and features that should see this nameplate through to its next full redesign, which is likely for model-year 2019 or ’20. Is the 2017 styling different? No. It’s same the look that came on line for model-year 2015, when Sonata was last fully redesigned. The styling is by no means dated, although it doesn’t cut the radical figure of the 2011-2014 Sonata. That car burst into the midsize segment with flamboyant lines that made rivals seem stale. It influenced the design of virtually every competitor. But Hyundai evidently found it too adventurous and dialed things back for ’15. It didn’t compromise packaging, though. This is among the most spacious cars in the class, with terrific headroom and legroom front and rear. At 16.3 cubic feet, trunk volume leads the segment, too, although the hybrid models’ have just 13.3 cubic feet because of space consumed by their battery pack. The dashboard is well laid out. Controls are generously sized and marked for easy use and move with a satisfying tactility. A decent blend of sturdy plastics and padded surfaces line the cabin, with leather optional on the Sport 2.0T model and standard on Limited versions. Visual differentiators include extra chrome trim, LED daytime running lamps, and 17- instead of 16-inch alloy wheels starting with the Sport model. The 2.0T versions have 18-inch alloys and unique sporty touches inside and out. Hybrids have grilles and other tweaks intended to improve aerodynamics. No. Sonata continues to favor an absorbent, quiet ride over sharp handling; even the 2.0T models with tauter suspension tuning don’t approach the all-around road-worthiness of rivals like the Honda Accord and Mazda 6. Powertrains are more competitive. Every Sonata has a four-cylinder engine. Grouped under the 2.4L suffix, SE, Sport, and Limited get perfectly adequate acceleration from a 2.4-liter with 185 horsepower and 178 pound-feet of torque. Even though its smaller 1.6-liter has 178 horsepower, the Eco feels a bit livelier because the turbocharged engine produces 195 pound-feet of torque. While all other Sonatas have a smooth-shifting six-speed automatic transmission, however, you’d need to get accustomed to the sometimes-jerky shifts of the Eco’s automated manual gearbox. With the 2011 Sonata, Hyundai pioneered an all-four-cylinder engine roster in this segment and its stand-in for the V-6 still offered by some competitors is a turbo 2.0-liter with 245 horses and 260 pound-feet of torque. Despite some pause when you hit the gas, it gives the Sport 2.0T and Limited 2.0T satisfying get-up-and-go, though without the linearity of rivals’ six-cylinders. The Hybrid and Plug-In Hybrid models team a 2.0-liter gas engine with electric propulsion. In the Hybrid, the two work independently or in combination to automatically furnish the best combination of power and fuel economy. Net horsepower is 193, the battery is recharged through regenerative braking, and electric-only range is insignificant. In the Plug-In Hybrid, the 2.0-liter teams with a larger battery that can be charged from the power grid to furnish 27 miles of travel on battery power alone. Then the engine kicks in and it operates like the conventional hybrid; net horsepower is 202. Both hybrids do a good job disguising their syndicated powertrains, but with gas prices low, their higher prices versus the fuel they save keeps their share of Sonata sales under 10 percent. In practice, it’s unchanged. Some EPA city, highway, and city-highway-combined ratings drop 1-2 mpg, but that’s a function of recalculated testing designed to better represent real-world fuel economy. Sonata’s fuel economy stays about mid-pack in the segment, behind more recently redesigned rivals with newer, more efficient powertrains. In the 2.4L family, the Base and SE models rate 25/36/29 mpg city/highway/combined, the Sport and Limited 25/35/28. The Eco rates 28/36/31 mpg, the 2.0T Sport and Limited 23/31/26. Hybrid ratings are 39/45/42 mpg city/highway/combined for the Base model and 38/43/40 for its better-equipped companion (see below for related info). Both Plug-In Hybrid trims rate 99 mpge, the EPA’s calculation of overall gas-mileage equivalency when electric-only range is included. Running as hybrids, they rate 40 mpg city-highway combined. Aside from introduction of what Hyundai calls Dynamic Bending Light, changes involving features run to availability adjustments and contractions, not additions. Dynamic Bending describes the new steering-linked capability of the xenon headlamps that were already standard on the Limited 2.0T and optional on the Limited 2.4L as part of its $3,400 Tech Package. The other notable changes involve expanding the line via the entry-level model and stripping some standard and optional equipment from the Sport 2.4L and Sport 2.0T. Replacing the SE at the bottom of the lineup – and accounting for that $150 savings — the new Base 2.4L model comes standard with such features as 16-inch alloy wheels, chrome window surrounds, heated mirrors, remote keyless entry, full Bluetooth integration, and 60/40 split/folding rear seatbacks. But you now have to step up to the SE to get such amenities as a rearview backup camera, automatic headlights, Hyundai Blue Link telematics with Android and Apple connectivity, and a 7-inch dashboard screen. Both the 2.0T and 2.4L Sport versions again come with the aforementioned cosmetic touches, plus dual exhaust, a power driver’s seat, dashboard stitching, and faux carbon-fiber interior accents. On the Sport 2.4L, however, the previous $1,900 Sport Premium and $2,400 Sport Tech option packages contract to a single $950 Sport Value Edition Package. It combines their most popular features, such as a moonroof, hands-free power trunklid, pushbutton ignition, and heated sport front buckets with leather bolsters. No longer available on the Sport 2.4L are such items as blind-spot and rear cross-traffic alerts, a navigation system, and dual-zone automatic climate control with rear-seat vents. The Sport 2.0T returns with all the 2.4L standard equipment, plus a leather-wrapped flat-bottom steering wheel with transmission paddle shifters, and quad exhaust tips. But to trim that $2,600 from its base price, the Sport 2.0T is no longer available with blind-spot and rear cross-traffic alerts, xenon headlamps, pushbutton ignition, dual-zone automatic climate system, and various other comfort, convenience, and cosmetic items. All those features are again included on the Limited 2.0T, which also continues with standard adaptive cruise control to maintain a set distance from traffic ahead, an electronic parking brake, rear parking sensors, panoramic moonroof, heated and cooled front seats, heated rear seats, and the safety-rating-enhancing automatic emergency braking. Those driver aids are available on the Limited 2.4L within its $3,400 Tech Package and $1,750 Ultimate Package. 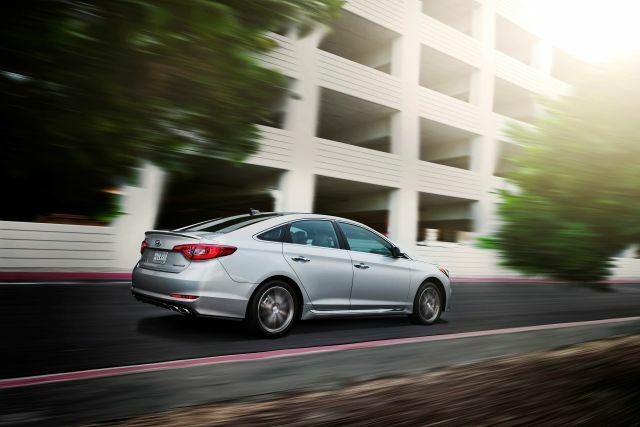 This year’s adjustments sustain Sonata’s highly competitive pricing, a Hyundai brand trait. And the automaker has simplified matters for ’17 by streamlining equipment offerings, some of which we’ve already described. More broadly, there are no options available on the 2.4L Base or SE models, the Eco, or on either 2.0T model. Base prices include the manufacturer’s $835 destination fee. In the 2.4L line, the Base model is priced at $22,435, the SE at $22,785, and Sport at $24,235, and the Limited at $27,985. The Eco lists for $23,960, the Sport 2.0T for $27,435, and the Limited 2.0T for $35,185. 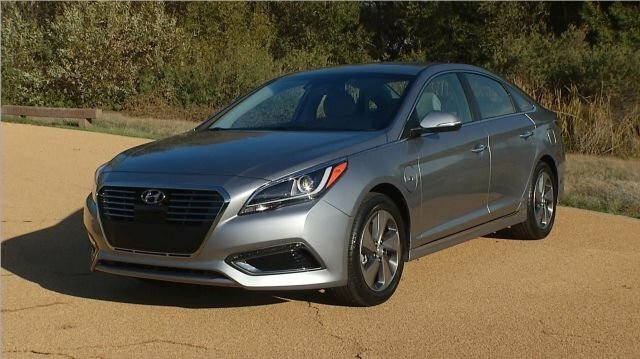 Hyundai had not released information or pricing on the 2017 Sonata Hybrid or Plug-in Hybrid in time for this review. The 2016 Hybrid was priced at $26,825 in Base trim and at $30,925 in upscale Limited form. The Plug-In Hybrids started at $35,435 and $39,435, respectively. It’s possible Hyundai will adjust equipment levels to reduce pricing, and could downgrade the upscale Hybrid and Plug-in Hybrid editions from Limited to SE trim. Plug-In buyers should again be eligible for federal tax credits of almost $5,000, with additional local tax incentives possible. How does the Sonata handle in the snow? Well enough, thanks to its front-wheel drive, which benefits traction by locating the weight of the engine and transmission over the tires that also propel the car. Tires on every Sonata have all-season tread, which is better than the handling-oriented summer-only tread offered on sporty versions of a few rivals. Narrow tires cut through standing snow better than wide, so best snow handling in the Sonata line goes to the Base and SE 2.4L models, the Eco, and the Base Hybrids and Plug-in Hybrid. Near the other end of the spectrum are the 2.0T models, which have the widest tires in the line. For maximum snow performance in the midsize-car class, look for all-wheel drive (AWD). It multiplies traction by sending power to all four tires. The segment’s snow champ is the Subaru Legacy. It’s the only car in the class to come standard with AWD, and Subaru calibrates the system and tires as complimentary pieces in the pursuit of grip. AWD is optional on the Chrysler 200 and several versions of the Ford Fusion, although the tires on the Fusion Sport model are optimized for dry-road handling. The 2017 Sonata 2.4L, Eco, and 2.0T lines went on sale in July 2016. The ’17 Hybrid and Plug-in Hybrid are set for release in the fall. The Plug-in was initially available only in California, Connecticut, Maine, Maryland, Massachusetts, New Jersey, New York, Oregon, Rhode Island, and Vermont. Availability could be expanded for model-year ‘17. Chrysler 200, an underperformer in virtually every dimension; and Nissan Altima, which is undercut by poor road manners and the lazy response of its continuously variable transmission. Note that the Kia Optima from Hyundai’s corporate partner shares Sonata’s basic engineering, powertrain, and features, but has different styling. Honda Accord, dollar-for-dollar, contender for the best all-around midsize sedan in the world; Mazda 6, handling and style champ of the class; Chevrolet Malibu, redesigned for 2017 to finally qualify as family car that’s appealing to drive. A 2018 freshening that recaptures some of the styling excitement of the 2011 Sonata, while also improving handling and, especially, steering feel.